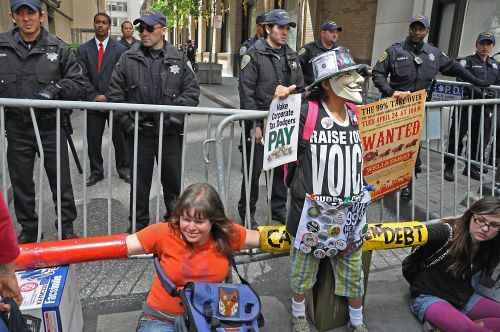 SAN FRANCISCO, U.S., Apr 25 2012 (IPS) - More than 1,000 people took the Occupy Wall Street Movement message straight to the one percent Tuesday, most of them rallying outside the Wells Fargo stockholders meeting in the heart of San Francisco’s financial district – and some 30 of them “mic-checking” inside the meeting. Protesters, many of whom had come from out of state, targeted what they said was Wells Fargo’s high rate of foreclosure, predatory lending practices, tax dodging and investing in private immigrant detention centres. Wells Fargo is the nation’s largest mortgage lender. Rev. Gloria Del Castillo, of the Buen Samaritano church in San Francisco’s largely Latino Mission District, came to the protest as part of an interfaith organisation working for economic and social justice. Her understanding of the mortgage crisis is not theoretical. Barbara Casey was among the limited number of protesters who were able to tell Wells Fargo CEO John Stumpf to his face what they thought. Casey, secretary treasurer of SEIU 503 trade union in Portland, Oregon, was one of the 100 or so demonstrators who had bought single Wells Fargo shares or obtained proxies, allowing them, in principle, to go into the shareholder meeting. And she was one of about 30 who actually made it into the meeting. and June 1, the Wal-Mart Shareholder meeting, Fayetteville, Arkansas. Casey contends Wells Fargo management deliberately excluded most of the protesters with appropriate shareholder documents. When he said it was a difficult year for Wells Fargo, “That’s when some of us stood up and said it was a difficult year for many families,” and commented on the 11 million foreclosures that Wells Fargo was involved in, Casey said. “As we each made a different remark, the rest of us chanted – that kind of…mic check kind of scenario,” Casey said. “So as we were either initiating a remark or chanting one, one by one, a policeman came for each one of us.” Casey said the officer was polite and said he wouldn’t cite her if she left quietly, which she did. About a dozen people were reportedly arrested inside the shareholder meeting after Casey and others were removed. Another group of protesters who had blocked entrances were also arrested. Reyes said she came to the march and rally both because the domestic workers coalition is concerned that Wells Fargo “is supporting immigrant detention” and because her family had lost their home last year. “We had been living in it for eight years,” she said. “That was our American dream.” The mortgage doubled at the same time her brother lost his job, and they couldn’t afford it. Bank of America foreclosed. Protesters called Wells Fargo “tax dodgers”, and placards read, “Make corporate tax dodgers pay.” According to a report by Citizens for Tax Justice, Wells Fargo paid 3.8 percent in federal taxes between 2008 and 2011. Pulido said the company paid six billion dollars in taxes for 2011 and 33 billion in federal taxes over the previous 10 years. John Shaban was among the protesters who own one share of Wells Fargo stock and was ready to go into the shareholder meeting. Interviewed early in the morning, just after Shaban had completed training that was aimed at helping people make non-violent decisions about what to do when faced with possible arrest, he said he hoped to tell Wells Fargo officials and stockholders that they should make better decisions when it comes to foreclosing on properties. Foreclosure takes the property off the tax rolls and lowers property values in the entire community, he said.